One minute of dodging the packs of mopeds in Syndagma will prove that Athens refuses to become a museum. The city's past and present coexist in a strange yet beautiful harmony. Ancient ruins sit quietly amid the hectic modern streets as quiet testaments to its rich history, and the Acropolis looms larger than life over the city, a perpetual reminder of ancient glory. Hellenistic monuments and Byzantine churches recall an era of foreign invaders, when Athens was ruled from Macedonia , Rome , and Constantinople . The reborn democracy of the past two centuries has revived the city in a wave of madcap construction: the conflicted, oddly adolescent metropolis has gutted its crumbling medieval mansions to become a dense concrete jungle. Countless vantage points from Athens 's seven hills look out over this sprawling work of centuries: Lycavittos, the Acropolis, Pnyx, Strefi, Philloppapou, Hymettus and the Hill of the Nymphs. Crowded, noisy, and totally alive. In the past 100 years, the city's population has exploded from a count of 169 families to almost half of Greece 's 10.5 million residents. The prep­arations for the 2004 Olympic Games have sparked another urban renewal, as the transit authority fights the sinister nefos (smog) by banning cars from historic Plaka, limiting driver access downtown, and building a new mass transit subway. Online Travel guide with the best accommodation in Athens. Find the cheapest hotels is Athens & get exclusive online deals. Great rooms at bargain prices. Book online now! Compare Hotel Prices and read Reviews from others. Great Hotel rates and information See photos, reviews & what's nearby Athens . 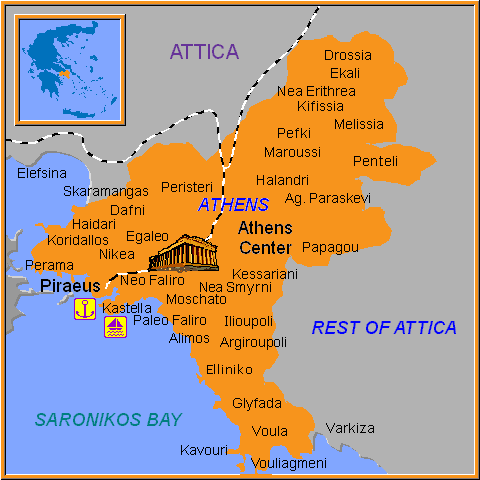 Detailed tourist and travel information about hotels of Athens providing also regional information.